One of the important benefits to becoming an Associate or Full Member of The New 49’ers is that you are able to participate for free in all of our organized Weekend Group Mining Projects and keep an equal share of the gold that we recover. 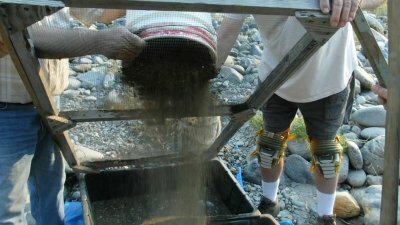 We have sponsored these projects every season since 1987 when we realized that many or most members needed some direct exposure to successful gold mining projects so they could go out and find gold by themselves on our extensive gold properties along the Klamath River and its tributaries in northern California. Reading about how to prospect for and develop rich gold deposits sets a good foundation. But there is no substitute for going out with a group of very experienced prospectors and participate in a successful mining project. Actually seeing how the techniques and processes work is very valuable to progressing through the learning curve. But perhaps the most important part of these projects is that everyone gains the objective reality and confidence that there really are high-grade gold deposits to be found if you just stick to a basic sampling plan. Fortunately, we have quite a few experienced members who like to come out on the weekends with us and help less experienced members learn the basics as we aggressively sample for a valuable gold deposit. We try to find one that is close to the surface so we don’t have to dig very deep. Then we join together in about three hours of hard work to recover as much gold out of the deposit that we can. We had about 45 members on this particular project, including 10 or more volunteer helpers. I thank my lucky stars for the volunteer members who join us on these weekends. There is no way I could manage projects with so many people on my own. I believe the largest weekend group we ever had was around 207 members. That’s not a group. It’s an army! Even with plenty of helpers, I had to buy a megaphone to communicate with so many people out alongside the river! 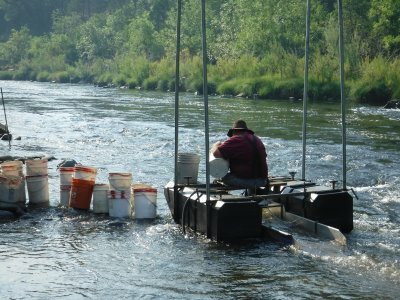 This project was planned on our Sluice Box property which takes in around 4 miles of the Klamath River just downstream of the small town of Seiad. That is about 20 miles upstream of Happy Camp where our headquarters is located. We have been making the Sluice Box property available to members since the late 1980’s. The property is always producing well for streamside mining. This is because it replenishes its shallow gold deposits every winter from high storm flows. 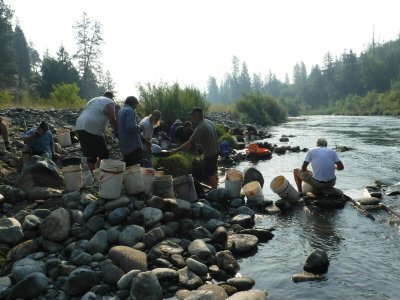 We have sponsored quite a few group projects on Sluice Box, both with suction dredges, and by digging the shallow gold alongside the river. Over the many years, there have been numerous gold rushes to Sluice Box both in and outside of the active waterway. As shown below, the property continues to produce good results. This is true even in the very same places that we have mined in the past. No kidding! 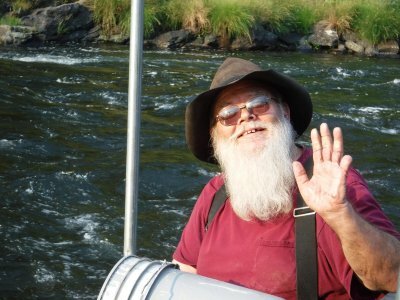 The reason we chose Sluice Box for this particular outing is that the most recent gold rush I was aware of happened towards the top end of the property during the 2017 season, and extended into the beginning of the 2018 season. In 2017, there was so much energy in the group of members that made the strike, when I went up there to have a look, I got the clear impression that I would make a bunch of good members upset if I directed dozens upon dozens of new members nearby to do a weekend project. Gold has this effect on just about anyone. 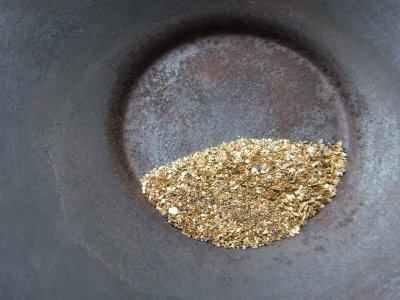 If you have not had “gold fever” yet, it is only because you have not found a rich enough gold deposit. It is only reasonable that if (when) you locate a rich deposit of pure wealth; you want to recover as much of it for yourself as you can. Most often, you don’t want to share the deposit with the whole world. The only time I get the cold shoulder from a group of members out on the river is when they have found something really good and do not want a whole bunch of others moving in on them. We have rules that protect the deposits members find so they can take their time developing the site and not have to worry about others jumping in right on top of them. As manager of The New 49’ers, I have to abide by our rules more than anyone else. Still, because it is good for other members, and helps keep our bills paid; it is in my personal interest to figure out how to introduce as many members as possible to high-grade gold deposits when they are discovered. Therefore, occasionally some members conspire to keep newly-found rich gold deposits a secret (which is impossible to do). To find them, we just have to watch where a bunch of members flock to along our extensive gold properties. The thing is that high-grade gold follows a continuous path down more than 100 miles of the Klamath River. So when a rich discovery is made, I can usually organize an experienced sampling team to locate an extension of the very same high-grade by sampling further up and downstream along the very same path, down to the very same layer in the streambed material that is paying. If we cannot do this without stepping on the discoveries made by other members, we have plenty of other places to go. 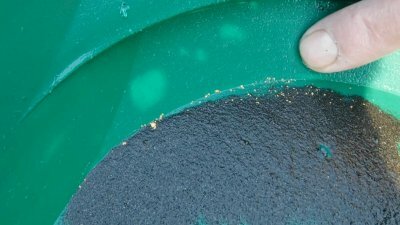 I knew about the small gold rush at the top end of Sluice Box towards the end of the 2017 season. Myself and a few helpers launched my boat to go take a look at what they found, and to see if it would be practical to do the final weekend project a respectable distance downstream of the strike. As it turned out, there was a long stretch of river available downstream of the strike. But the vibes I was getting from the active members upstream was that at least some of them would be unhappy if we moved in there. 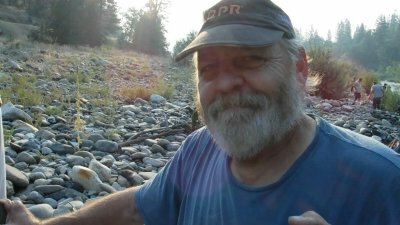 Having been managing The New 49’ers for about 35 years, I have learned that it is never a good idea for me to organize mining projects, or do my own mining, in close proximity to an active strike where all or some of the existing members are emotionally jacked up over the gold they are finding. Therefore, we did something else on our final project that season. All of our sample pans were looking good, and the gold was coming right off the surface of the streambed! With the 2018 season upon us, we returned to Sluice Box and only found a few members mining along the road-side edge of the river near the top end. As I said, there is a long stretch downstream of the original strike that has yet to be sampled or mined. These members were as friendly as can be, and actually encouraged us to do the project up there any place we desired. They showed us the gold they were recovering out of very shallow streambed material along the edge of the river and even out into the river as far as they could reach. The gold was quite good! When we launched my boat and all the gear to support this project, all or most of the members who were already at Sluice Box helped us pack gear to the site and set it up. They went so far as to show us the gold they were recovering, and the exact streambed layer that was producing the gold. This was great! It meant that we already had a gold strike even before we began the project! We do a Saturday morning meeting to introduce everyone, especially the project helpers. Then I devote the morning to a blackboard demonstration about how gold deposits in waterways and how to follow a simple sampling plan to, step by step, walk yourself right into high-grade gold. Then, after lunch, we go out to the site and devote the afternoon doing gold pan samples to confirm the gold deposit we will all work together for several hours on Sunday morning. John Rose has been our project manager for quite a long time. There are two objectives on Saturday afternoon on these projects. The first is to make certain that everyone is able to pan gold correctly. The reason for this is that if you cannot pan gold without losing any, you cannot sample for rich gold deposits. Sampling is the process you go through to locate and develop rich gold deposits. 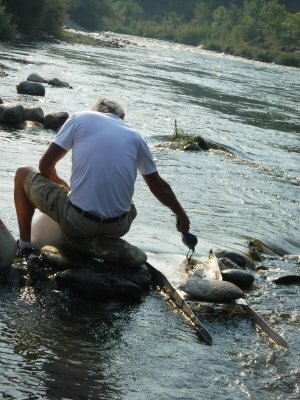 So gold panning is pretty-much the first important step in the learning curve. The second objective on Saturday afternoon is to confirm a rich gold deposit that we will all work together on Sunday. It wasn’t long on Saturday afternoon before nearly everyone was recovering a good showing of gold in their pans. Our helpers dedicated themselves to helping beginners with their panning skills. Putting on these projects requires me to delegate nearly all of the management duties to our helpers. John Rose takes charge of the entire outdoor program. This frees me to capture some images and video so I can tell the adventure story in a monthly newsletter at some later time. Dickey Melton takes pleasure in feeding pay-dirt to our main gold recovery system. Diane Peirce is designated as our “gold girl.” She places all the gold we recover on Sunday inside of a good plastic bucket with a twist-on, locking lid. The thing about gold is that if you do not handle and take careful control of it as soon as it is recovered from the ground, the gold will find some way to get lost. This is absolutely true! Diane Helgesen is a longtime supporter who never misses an opportunity to volunteer herself on any and every New 49’er event. You never met a happier or more loyal person. She also adds humor and fun times to the collective group chemistry. She took on the “gold girl” responsibility on this project. She also works with me in capturing images and video. When you see me slip off my more serious demeanor on camera and break out into a smile (sometimes I even laugh), you know it is because Diane is there behind the camera adding fun to what is otherwise a serious activity for me. There are several reasons that I personally take these projects very seriously, even though they are mostly fun and entertaining for everyone else. Part of this is because there are rules we must follow to avoid problems with local officials. Also, with so many people out there on the rocks and in the water, accidents do occasionally happen – which is never good. This normally has to do with someone losing balance and taking a fall on the rocks. Perhaps the main reason I take these projects serious is that the final clean-up steps and gold split on Sunday afternoon is my responsibility. Everyone works hard out there. Most people by Sunday afternoon have gained enough exposure to the processes we employ are already aware that prospecting is a hit or miss program. There are times when you don’t recover very much. I have been told endless times over the years that participants are happy with the education and exposure to gold prospecting, and really don’t care about how much gold they get as their share of what we recover. But I know from long experience that it is much more satisfying to everyone if they go away Sunday afternoon with a nice share of gold to show for their effort. While other very dedicated helpers contribute to this, the ultimate responsibility to make it happen falls squarely upon my shoulders. When we are capturing this much gold in a single pan of the material we are processing, I don’t need to worry about how the splits are going to come out at the end of the day! There are numerous regular helpers on these projects; too many to name here. But I must acknowledge Craig Colt and Derek Eimer who are perhaps our most serious gold prospectors. Also, Laura Bagley and Scott Coleman are local members who do prospecting nearly every day of the year, unless the snow is too deep to allow access to the streambed material. Nancy Aberg never misses a weekend project even though she has to travel perhaps 100 miles each way over windy roads to join up with us. Ray Derrick, now living in Arizona, also joined us on this project. Many years went by when Ray never missed a single weekend project. We end off rather early on Saturday afternoon so we can freshen up and prepare for a potluck at the Grange Hall which begins at 6:30 PM. 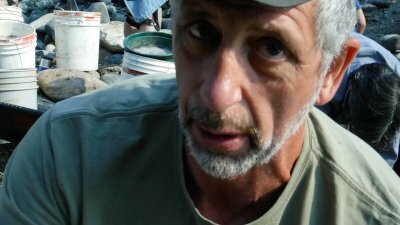 The gold panning was so productive on this Saturday; a bunch of the participants were still hard at it when I returned to Happy Camp. 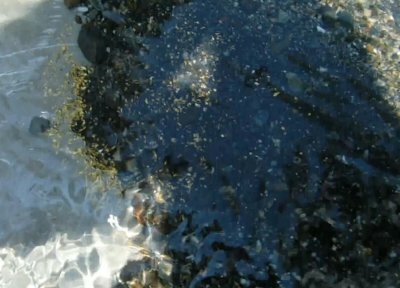 For some participants, the gold they recover on Saturday afternoon is the first gold they ever recovered. Some people never do break away from the gold adventure on the river and make it to the potluck. Instead, they go get flashlights to assist with their panning activity late into the night. Even so, our potluck at the Grange Hall in Happy Camp was a full house. There was plenty of scrumptious food to go around. The roar of exciting conversations was so loud; it took some doing to quiet the room so I could tell everyone that dinner was ready. We have a bunch of local members who have either moved to Happy Camp altogether, or at least spend the entire summer seasons there. Many of these folks have already done the weekend projects, so we only see them around the office when they come in, or at the Saturday potlucks. All active Members are invited to join our group dig on Sunday morning. We begin the group dig early on Sunday morning; usually at around 6:30 AM. The main reason for this is to complete the physical labor before the heat of the day reaches the site where we are working. When I arrived at Sluice Box, nearly everyone else was already hard at work. 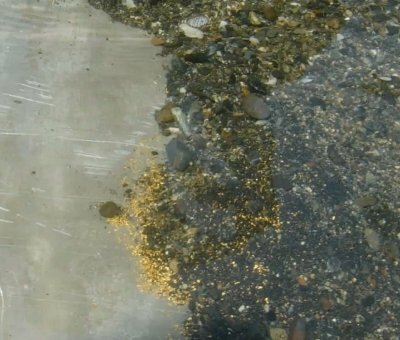 Everyone already knew at what layer in the streambed the gold was coming from. This time, the pay-dirt was directly on top of the streambed. So digging was going to be rather easy. We had already set up and dialed in our floating recovery system on Saturday, so Dickey was ready for the first bucket of pay-dirt as soon as he arrived. We discovered on earlier weekend projects that when the pay-dirt is close to the surface, a group project can generate rich pay-dirt faster than our floating recovery system can process it. 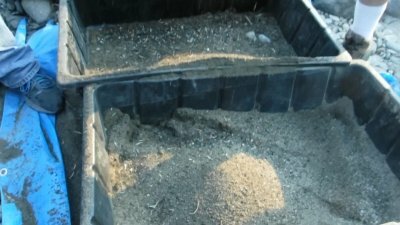 If you feed any gold recovery system too fast, the gold traps become buried and some portion of the gold will be lost with the tailings. Not good! As it was, the production crew produced more pay-dirt than both recovery systems could keep up with. It is not unusual on these weekend projects to have so many buckets of pay-dirt that there is not enough time to process it all. When this happens, we invite participants to take what they want to process for themselves at some later time. Here is a typical pan that Scott Coleman showed me of the material that was being sent to the recovery systems. We are rather informal on Sunday digs in that as long as we are producing more pay-dirt than we will be able to process, participants are encouraged to take breaks whenever they feel the need, consume some nourishment and fluids, and pretty-much not overdo it. Here is my summary of what was taking place out there on Sunday morning. As you can see, things were going so well, I was in a light-hearted mood. Diane was also pulling my strings; we were having some fun out there! We stopped the production team at around 11 AM. There remained at least an hour of processing pay-dirt which had already been dug. While the processing continued, the production team reclaimed the areas that had been disturbed. They moved rocks, gravel and tailings into the holes to return the gravel bar to the natural contours that were present before we got started. I gathered up about a dozen helpers to fill in a fairly large excavation that someone else had made downstream and did not fill in. That actually took us about an hour! Members are supposed to reclaim their excavations when they are done. But sometimes fairly large excavations are left behind when members (or perhaps nonmembers) depart. When this happens, the rest of us must do the reclamation so we can stay off the bad list of local officials. Directing a controlled flow of water over the concentrated material in the floating recovery system allowed the lighter material to be washed away while the much heavier gold lagged behind. Seeing all that gold in the recovery system was truly a sight to behold! 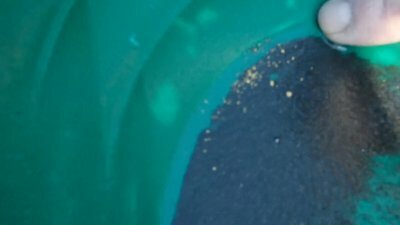 Any worries I had about having enough gold to do a good split were evaporated from my mind as I watched the water concentrate millions of small flakes of pure wealth as we washed them into a large plastic tub. It was quite a show that reminded me of earlier days when we were allowed to suction dredge out in the river! The Gold Girl was right there with her special plastic bucket to take possession of the very valuable gold-laden “concentrates” from the recovery system. With just a little work, all remaining gear and tools were secured and put away safely. Everyone was allowed some time to relax and freshen up. Then we at met at the Grange Hall in Happy Camp later in the day. With all or most participants present at the Grange early on Sunday afternoon, we demonstrated the final clean-up functions using gravity methods. This is without the use of any chemicals. 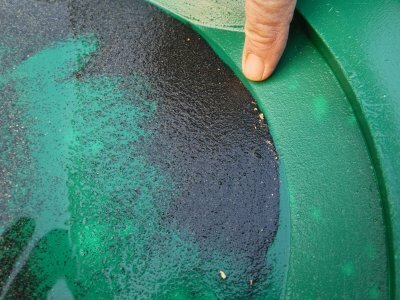 It is extremely important if you plan to do gold prospecting to learn how to do the final steps to separate all remaining impurities from the gold that has been recovered. By “impurities,” I’m mainly talking about heavy iron sands and small iron pebbles which also become trapped in the primary recovery systems. Over the many years, we have perfected this procedure and have demonstrated it to thousands of participants on these weekend projects. The entire process takes a few hours, mainly because we go slow to explain what we are doing, and to avoid losing a single speck of gold. The entire final clean-up process would only require an hour or so if I was working on my own concentrates. The reason is that I am not worried about saving every speck of gold, no matter how small. When allowed, I go for filling up bottles of gold (raw wealth) rather than allow my focus to be on a few (or many) tiny specks that don’t add up very well on a scale. But this was not my gold. So I invested the extra time to make certain that nothing of value was lost. This requires more time. We allow project participants to participate in these final steps. Everyone is allowed to watch. This is not one of those programs where we take the concentrates into a hidden room and then come out later with a share for everyone. This is real small-scale gold mining where participants are allowed to be present every step of the way. The value in getting direct exposure to these processes cannot be understated. In my early days, I had to figure out most of these processes on my own. There were plenty of painful lessons along the way. As far as I know, The New 49’ers is the only mining association in the world that demonstrates all of the required steps necessary to become a successful small-scale gold miner. In all, we recovered 292 grains of gold. This is a little more than 12,1 pennyweights (20 pennyweights equal one troy ounce). This was about $800 at today’s gold price – all in about 3 hours of work. I made an offer to keep all the gold for myself in exchange for all the pizza and beer necessary for all participants to celebrate our successful day. But not a single person was interested in that. They all wanted their shares! So we split 6.4 grains by weight to each of the 45 participants that remained. Needless to say, making 292 grains of raw gold come out evenly between 45 people presents a challenge all in itself. It is easier for me because I have made these splits come out hundreds of times in the past. More importantly, I had to endure the personal embarrassment several times when we came up short on the final shares. True to my word, I had to make up the difference out of my own gold collection (ouch!). The most difficult part in all of this is to keep order as we give the gold shares away. The noise of enthusiasm in the Grange Hall becomes almost deafening. During my early years, I used to try (and failed every time) to keep all this noise under control. It was impossible! After a while, I realized this was the enthusiastic response that we wanted to generate. We just had to learn how to work around it You have to accept thankful forms of appreciation however it comes to you! Looked at in this light, I am very thankful that I have devoted my entire adult life to small-scale gold mining and the wonderful people who are attracted to it. Here was one more time that we sent a bunch of enthusiastic members off with the confidence and knowledge that high-grade gold is available for the taking if you just work at it. Being able to locate and recover your own gold, and stashing some away, provides you freedom from the misguided dictates of governments that have lost their way. Gold is the ultimate currency which has a fair exchange value wherever you go in the world – as long as you can manage your affairs so that the bad guys don’t take it away from you. On that note, I suggest that if you are free enough to put true wealth away in the form of gold, you are already much smarter than those whose only opportunity to acquire gold is to take it away from others. June 22 & 23; July 20 & 21; August 17 & 18. We shall monitor walk in traffic at our headquarter office in Happy Camp as we progress into the 2019 season. Until further notice, we will continue opening the doors between 9 AM and 4 PM on weekdays. The office will be closed on weekends, except for the morning hours during the Saturdays when we are sponsoring the coming season’s Weekend Group Projects: June 22; July 20; and August 17. If business is slow, sometimes the girls will close the office at 2:30 PM on Tuesdays. This won’t likely happen during the summer months. Still, we advise you to call the office in advance to make sure the doors will be open if you need to get inside to take care of business: 530 493-2012. Members are invited to sign in your whereabouts on our properties over the phone in case there is some reason we need to find you. Our mining properties are freely available to all members in good standing 24 hours a day, 365 days a year, unless the Klamath National Forest is closed due to wildfires. For any problems, our Internal Affairs is available over the phone: Richard Krimm is our Director of Internal Affairs, email or call (510) 681 8066 (also available after hours and on weekends). Most Recent Legal Fund Prize Drawing Winners! Ten 1-ounce American Silver Eagles: William Frese of Cincinnati, OH; Kim Ellison of Hayward, CA; Steve Perris of Eureka, CA; Eric Hansen of Happy Camp, CA; Cliff Leidecker of Rogue River, CA; Ronald Mathews of Peyton, CA; Chris Johnson of Talent, OR; Van Wilhite of West Point, CA; Michael Tietz of Proberta, CA; & Dennis Zander of Klamath Falls, OR. Ten 1/10th-ounce American Gold Eagles: Mark Newhagen of Hanover, MD; Steve Perris of Eureka, CA; Randol Thrasher of Atwater, CA; Kim Ellison of Hayward, CA; Russell Barrett of Redding, CA; Rebecca Parrish of Seattle, WA; Rodney Gunderson of Eatonville, WA; Ed & Diane Tillotson of Lake Havasu City, AZ; Stephen Perfetto of Menlo Park, CA; & Dennis Zander of Klamath Falls, OR. Twenty 1\10th-Ounce bags of beautiful Alaskan gold: Michael O’Connell of Crescent City, CA; Manuel Alcantar of San Jose, CA; Stephen Perfetto of Menlo Park, CA; KMS Electric Co. Inc. of Palm Harbor, FL; Micro Sluice Gold Products of Chetek, WI; Hank Fender of Chandler, AZ; Clifford Robinson of Oakland, CA; Charles Herren of Marion, IN; Marvin E. Duncan of Happy Camp, CA; Ronald Copenhafer of Malibu, CA; Donald Esch of Salem, OR; William Sowell of Sidney, NE; Robert Williams of Georgetown, CA; James Goularte of Paradise, CA; Mark Newhagen of Hanover, MD; Dennis Zander of Klamath Falls, OR; Jeffery Palme of Prescott Valley, AZ; Charles Rosebery of Cordova, AK; Matt Cottrell of Galt, CA; & Cheryl Lee of Klamath Falls, OR. Words alone cannot adequately describe the feelings of appreciation we feel for all our supporters who send in your contributions to The New 49’er Legal Fund. Without you guys, our small-scale gold mining industry would have been a thing of the past many years ago. As it is, we remain in the fight to regain our freedoms with a very important legal challenge that has been placed on the doorstep of the now right-leaning U.S. Supreme Court (Bohmker v. Oregon, 903 F.3d 1029 (9th Cir. 2018)). If you have not done so already, we are asking all supporters to send a letter to President Trump, his Solicitor General and several other officials, asking for them to help put attention on Bohmker v. Oregon, and encourage the Supreme Court to review this case. For your convenience, there is an Action Alert below which links to a sample letter from which you can copy and paste to create your own letter. The timing to send in your letter is perfect right now! This is because our official Reply to California’s Opposition is due to the Court in early April. We should also place some hope and faith in the Trump administration. Now that the 2-year cloud (hoax) has been lifted off of Mr. Trump, he and his team should be able to invest more resources into saving the once very productive resource development industries which supplied most of America’s continuous need for raw materials (timber, energy, minerals) from our federal lands. In large part, Mr. Trump won the presidency on his platform of “draining the swamp” which definitely exists within American politics and continues to hold down a substantial portion of the American economy. It is now becoming clear that the deep state (those very well connected individuals who are dedicated to turn America into a socialist country) organized a nation-wide all-out effort to bring down our president even before he won the 2016 election – all or mostly based upon a false narrative. It is a sobering realization of how powerful the deep state is when the President of the United States, even with all the resources at his disposal, can be brought to his knees for a matter of years all because of a false narrative perpetuated by perhaps half or more of all of America’s politicians, newscasters and political activists. Our industry has been brought to its knees by, more or less, the very same powerful bad actors or their affiliates who have perpetuated a hoax that in-stream mining is harmful to fish, even though the many studies have proven otherwise. This very same tactic was used to kill America’s once thriving timber development industry. Now, for lack of any reasonable sustainable development, we have vast reaches of public lands in America that have become severe fire hazards. 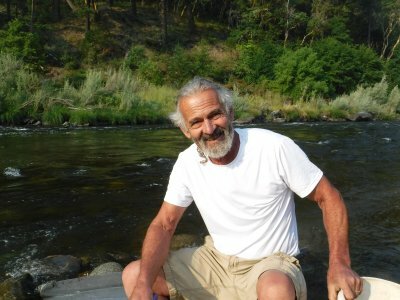 With a fair hearing in front of the U.S. Supreme Court, I believe we will be able to prove that the very same tactics by the very same or affiliated institutions, have succeeded in disallowing modern gold miners the use of any mechanized device to locate and develop America’s abundant gold deposits (true wealth) within 100 yards of any active waterway (Oregon and California, with other States not far behind). This, when there is no evidence whatsoever to demonstrate that we have ever harmed so much as a single fish! We are committed to keep fighting until either there is no hope remaining, or until we win back our most basic freedoms. As things are, perhaps we are closer than we have ever been to winning our industry back in full. My fingers are crossed on both hands! Thanks for all you guys do to support our efforts! 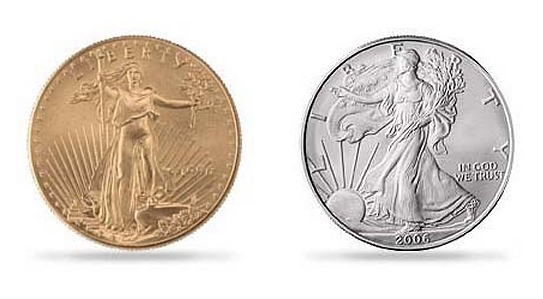 Upcoming Legal Drawing Will Have 3 Ounces of Gold & 10 Ounces of Silver Coins! This drawing will take place on Friday, 21 June 2019 at our headquarters in Happy Camp. You do not need to be a member of our organization to participate. You do not need to be present to win. There is no limit to the size or frequency of your contributions, or to the number of prizes you can win. This case originated in Oregon and has been supported along its way mostly by prospecting associations based in Oregon up until the present. The case is challenging the State of Oregon’s authority to prohibit mining on the federal lands. Many of you will recall that we made the final cut in the previous session of the High Court just this past year in Rinehart v. California. The Rinehart case was challenging the State of California’s authority to prohibit mining on the federal lands. Rinehart was rejected by the U.S. Supreme Court largely because of the Solicitor General, who has the authority to provide “yes” or “no” advice to the High Court as to which of the final cases should be reviewed. The Solicitor General advised the Court to reject Rinehart largely on the grounds that this Bohmker case would soon be along, and it frames the very same arguments in a more straightforward manner than Rinehart. I won’t go into the legal arguments here because of time and space. Let me just say that 150 years of case president supports our side. We believe that the existing High Court will also see it our way. The challenge is to get the U.S. Supreme Court to review Bokmker. After 9+ years of painful and expensive litigation, this is the industry’s final ongoing attempt to win our mining rights back. Since the Solicitor General advised the High Court to reject Rinehart, our attorney is requesting we make an all-out industry-wide effort to encourage Mr. Trump to become involved, along with the existing Solicitor General and other officials who have an active interest in mining activity on the federal lands. Upon competent advice, we have added the Supreme Court to the list.